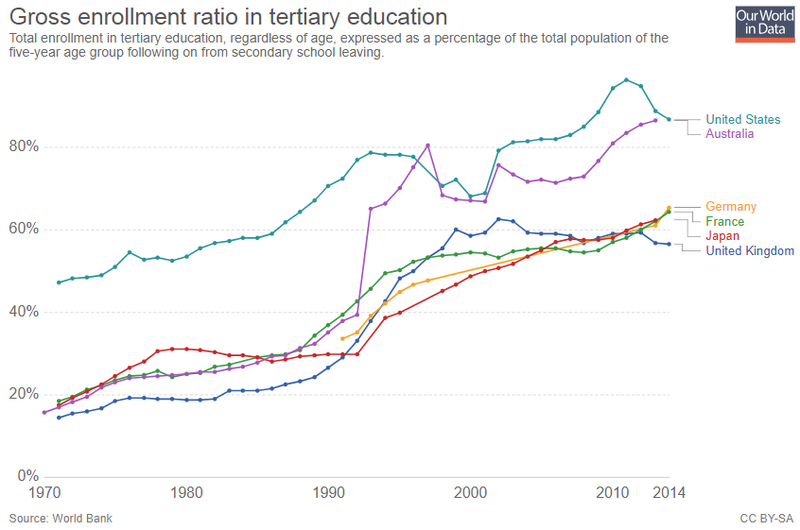 Why is the UK so far behind in Tertiary Education enrolment? As we wait for Philip Augar’s review of post-18 education, it is worth reminding ourselves how the UK compares to other high income countries on tertiary education. 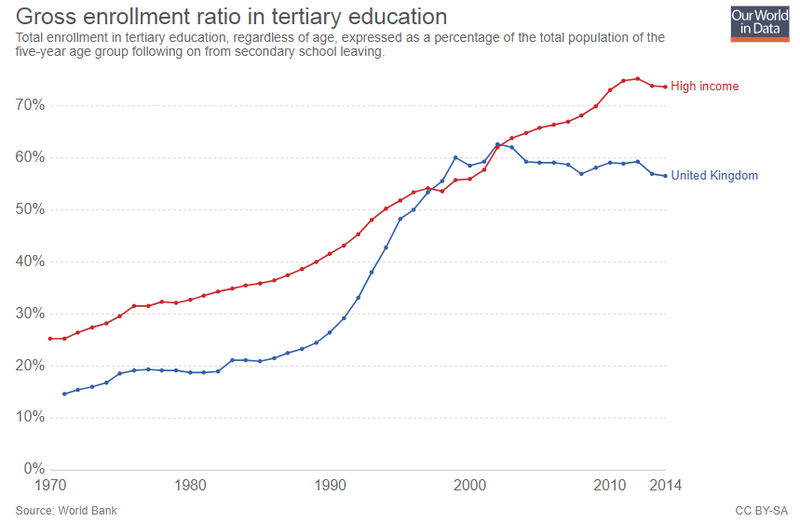 World Bank data on the gross enrolment ratio in tertiary education provides one useful comparison metric of what is happening on the macro scale. To be clear, this is not just measuring Higher Education, which the UK tends to score fairly well on, but all forms of education after higher secondary (defined as ISCED levels 5-8). The UK is well below almost every highly advanced economy in the proportion enrolled in tertiary education. It wasn’t always so. UK tertiary enrolment has been stuck since around 2000 while most countries have seen steady increases in the same period. The excellent website, Our World in Data, lets you choose whatever comparison countries you like. So feel free to try it out yourself with your own selection of comparisons for the UK. However, I’ve put my selection below. You can see that Anglo-Saxon nations like the US and Australia have been ahead on this measure for a long time. You can also see that other major economies, like France, Germany, and Japan had lower enrolment than the UK in the early 2000s, but have steadily overtaken since then. Of course, there is always I chance I could be cherry-picking my comparators, so here is a rather busy looking chart comparing most of the OECD member states. The UK comes almost at the bottom of the list, along with a few other countries with low tertiary enrolment namely Switzerland, Hungary, and Slovakia. 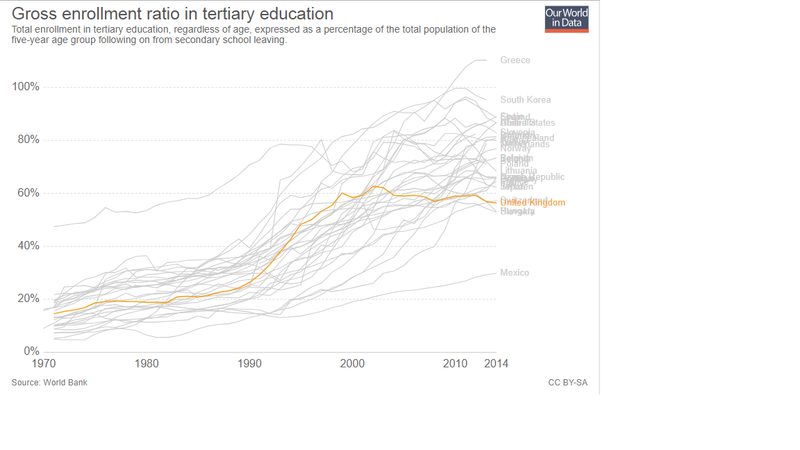 Only Mexico has substantially lower tertiary enrolment. 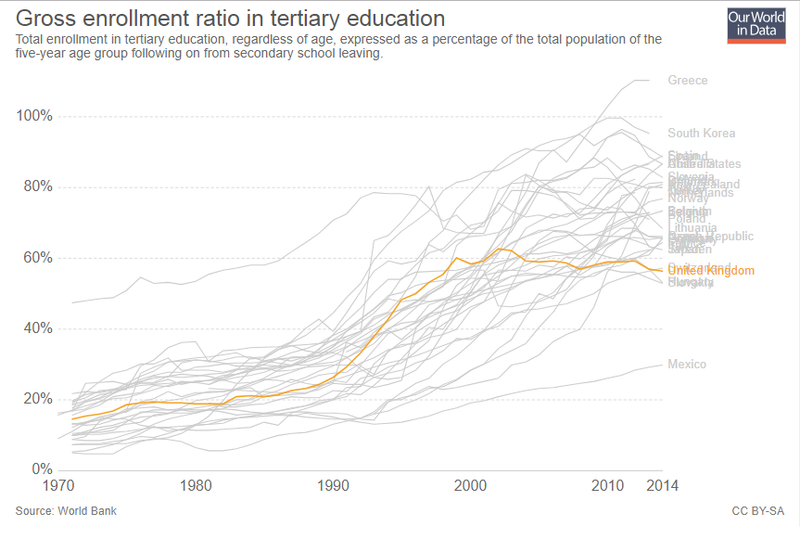 So why has the UK tertiary enrolment fallen since 2000 from the middle to bottom of the pack? One key element to this story has been the decline of below bachelor level qualifications, as is explained in detail in HEPI’s report into level 4 and 5 qualifications by Professor Dave Phonenix. The Augar commission has a remit for the entirety of post 18 education, unlike the Robbins or Dearing commissions which focused exclusively on Higher Education. Hopefully Augar will recognise how unusual the UK’s neglect of these qualifications is, and provide some answers to help the UK catch up. Of course, there are a lot of other factors and explanations at play. If you think you know another part of the answer then please send a tweet/comment/carrier pigeon our way.